Apparently, the no-tipping test at Joe's Crab Shack isn't working out. The casual seafood chain announced in November that it had been trying out a no-tipping model in 18 of its restaurants across the country since August. But less than a year later, the company is moving back to the standard gratuity model in 14 of the test locations. Bob Merritt, who became CEO of Joe's parent company Ignite Restaurant Group in November, announced the decision last week on the company's first-quarter earnings call. "Our customers and staff spoke very loudly [about the policy], and a lot of them voted with their feet," he said. 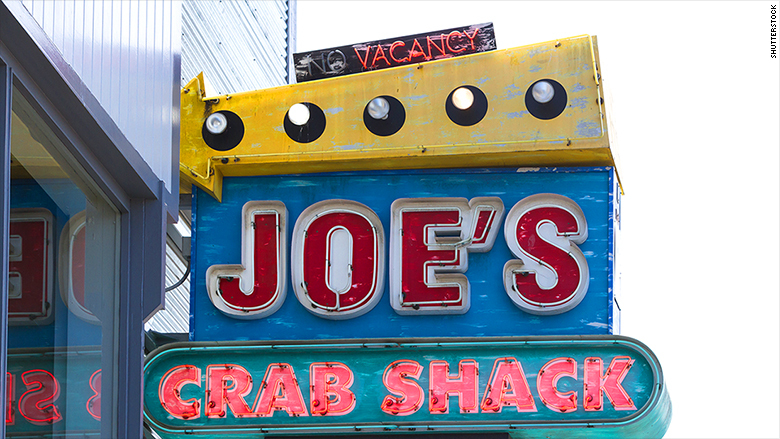 Joe's Crab Shack has more than 100 locations nationwide, and was the first major restaurant chain to test out a no-tipping policy. Prices at the pilot restaurants increased to cover the new labor costs. The pilot restaurants lost an average of 8-10% of customers during the test run. "We tried it for quite a while and we tried communicating it different ways," Merritt said. Getting rid of gratuity eliminates any math at the end of a meal, but it turns out customers don't mind the added work. The restaurant's research showed that around 60% of customers disliked the policy because it took away an incentive for good service and that they don't necessarily trust that management is passing along the money to workers. Menu prices at the 14 restaurants will decrease now that they don't have to include gratuity, but Merritt said it could take time for customers to return. "When you roll back prices, you rarely get credit for it very quickly, so it's going to take us time to rebuild that." The no-tipping structure will continue at four establishments where the policy caught on with customers, and Merritt said the company will work to figure out why the model was successful in those restaurants. The company did not immediately respond to request for comment Thursday. When the pilot program was initially announced, then-CEO Raymond Blanchette told CNNMoney that some workers left over the new policy, but that he expected the move to eventually increase retention and enhance the chain's bottom line. The company said in November there wasn't a timeline to make the no-tipping policy a standard in all Joe's Crab Shack restaurants.